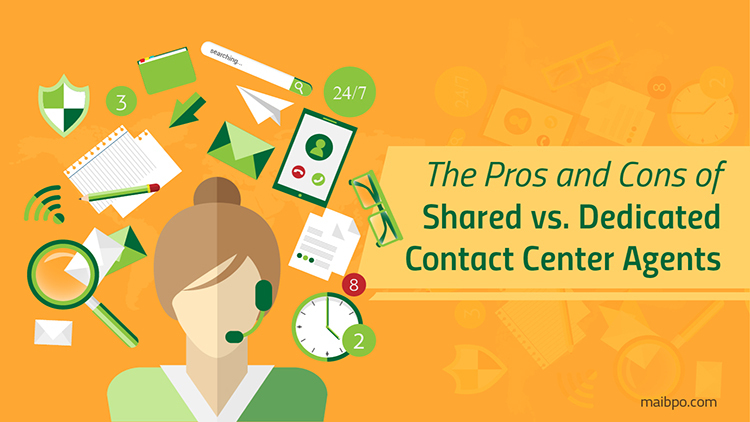 When you decide to outsource, it is vital to understand the difference between a shared and dedicated agent model within the contact center. Because there are pros and cons to both, it is to your benefit to explore which option would best suit the customer service requirements for your specific business. Companies with comparatively less predictable call volume or those who experience seasonal surges could choose shared contact centers. Businesses that require services during peak call periods can also opt for the same. The nature of the contact center does not depend on the size of your company. Shared contact center employees are usually highly efficient even if they often change hats to represent different clients. Companies with the possibility of having high call volumes could seek the help of dedicated contact center representatives. In this case, the contact center functions like your own business resource or as an extension of your own company. Agents undergo specific and intense training to learn your business processes, company culture and are also often coached on effective up-selling or cross-selling of your products and services. Both the shared and dedicated contact center models can provide good value for your investment. While dedicated agents may be capable of generating higher sales or increasing average order values, shared agents can typically provide satisfactory customer service on behalf of your organization. Many companies have opted to utilize a mix of shared and dedicated contact center agents to utilize the best of both environments. If you allow healthy interactions between the two groups, they can make useful recommendations to one another. In times when you hire shared employees to handle excess workloads, your dedicated agent team can assist in training the newly hired shared agents. It is important that you understand the requirements of your business before you venture into finding a contact center and deciding whether a dedicated or shared agent model is right for you. Investing in the right contact center environment is critical for your company as your 3PL partner will be responsible for helping your business grow.